How can people who claim to be followers of Jesus Christ live a life of EXCESS? "What IS excess?" "Is one person's excess different than another person's?" "Is living with excess ever ok? 1. The state of exceeding what is normal or sufficient. 2. An amount or quantity beyond what is normal or sufficient; a surplus. Ok. So...excess is having more than you need. But what exactly is a "need"? Is having a new living room set a need? Is having brand name clothing a need? Is having more than two pairs of jeans a need? Is having organic food a need? See what I mean? It's very difficult to nail down exactly what a need is. Everyone defines it differently. I may look at someone and think that they are living a life of excess...but chances are, they don't see it that way. They may see it as being "blessed". Each part of the country will have a different answer. Each income bracket. Each church. Each family. Has our definition of excess and need changed over the years? Yes. TV and advertising has radically altered our view of necessity. Your parents' and grandparents' definition of need is most likely different than yours. Go a few weeks without watching TV. Don't visit the mall. Don't read the advertisements from the Sunday paper or open "SALE!" emails in your inbox. 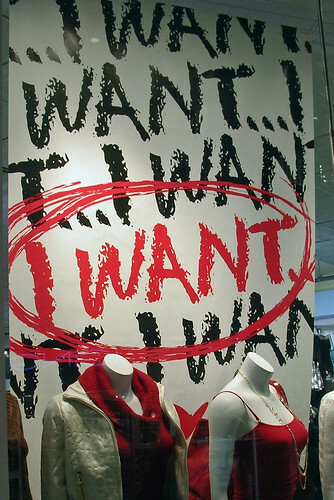 And then....see how different those wants and needs feel. How much less "urgent" they seem. Is excess having more than one of something? Is it having two or three or four of something? Bikes? Cars? Cell phones? Coats? Shoes? Pots and pans? Why do we have so many of these things? When there are people in the world without shelter, without food, without basic necessities...how do we go on accumulating more for ourselves? It reminds me of the quote by Ghandi, "Live simply so others may live". How can we stop consuming so much...so that we are able to provide more resources for others? I would suggest that we figure out WHY we are running after all of these "things". Why are people working 80 hours a week to pay for a house that they are never there to enjoy? I've heard it so many times since we hit the road for the tour...people saying "I wish I could do that!". When I tell them that they COULD do it...they give me all the reasons why they couldn't. They have a big house payment.They just bought a new car with payments. They have too much credit card debt. Notice a pattern? Everything holding them back is related to money. Money they spent that they didn't have anyway. They were seduced into believing they needed these things, and now they must work endless hours to pay for it all. And now they just want a real life. On a somewhat related note... I've often heard it said that if there weren't wealthy Christians with an excess of possessions and money, who would minister to the wealthy unbelievers? Who would be "in their crowd" to show Christ to them? What about Christians who use their abundant resources to reach the lost? Who open up their large homes for people to use? Could all of that extra money be used in a different way that is more effective in ministry? I don't know what the answer is to this. I've asked so many people this question over the years and no one gives me the same answer. My initial thought: Isn't God bigger than that? Does he not own all the resources in the world? I don't think it's necessary to "blend in" to the world to minister to the world. I think everyone could live simply and still minister to all types of people. I just wonder. I wonder what kind of amazing, crazy adventures God would take us on if we gave Him the reigns before we TOLD him what we were doing and asked Him to come along? Jesus makes it very clear in the following parable that having "riches" makes it more difficult, but not impossible to follow Him. I've found this to be so true in my own life. In times where our income has been small...I rely on Jesus for EVERY LITTLE THING. I ask him to help me be wise in my grocery shopping...to help me choose the right foods for the right price. When we are bringing in more money, I tend to forget about praying before I head into the store. More money feels like security. I mistakingly believe that I have provided myself with a safety net. But in reality...ALL things come from God. Nothing is ours to begin with. And if you continue on that road long enough...believing that YOU are the one who EARNED your income to buy all of your excess things, it will be harder and harder for you to rely on God for your daily needs. Jesus knew the seductive power of money...and this is why he spoke about it more than most things in the Bible. “If anyone has material possessions and sees his brother in need but has no pity on him, how can the love of God be in him?” (1 John 3:17). “Give me neither poverty nor riches, but give me only my daily bread. Otherwise, I may have too much and disown you and say, ‘who is the Lord’? Or I may become poor and steal and so dishonour the name of my God” (Proverbs 30:8). “And my God will supply all our needs according to his glorious riches in Christ Jesus” (Philippians 4:19). Living simply and giving money away to others is a radical way to live in today's society. But are we not called to live a life set apart? A life that is different? Right now, it just seems like most people are blending in. Be different...and confront your ideas about excess. I'd love for this to be a starting point for a discussion about these ideas...I truly have no answers here. In fact, I think I asked more questions in this post than I answered. These are ideas that are constantly in my mind...and I would love to hear your thoughts. I know there isn't one "right" answer to the question about having excess...but let's all learn from each other's experiences and insight. One of my Christmas gifts this year was a book that I've wanted for a LONG time...."Yurts: Living in the Round" by Becky Kemery. I have been pouring over it...learning about the history of this amazing structure and also falling in love again with the wisdom of ancient cultures. You don't have to be a nomad to recognize the beauty of the nomadic life...there is much to be learned from people who are truly living. 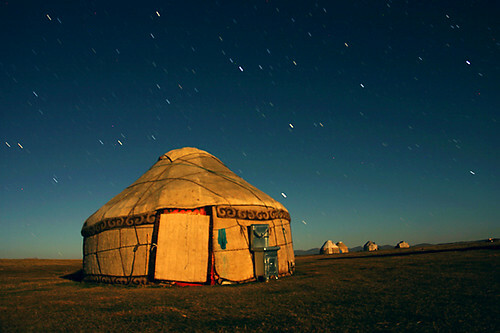 The Central Asian nomads live with deep-rooted simplicity. Nomads carry with them what they need. Each person, for example, brings his or her own cup, bowl, and utensils when traveling. Waste is unthinkable; once something has served its usefulness in one area, it is put to use as something else. Every possession is chosen with care an ideally serves multiple function. With few possessions, there is the opportunity to bring artistry to every element of daily life. And because everything has its place in the circle of nomadic life (a placement prescribed by the very fabric of the culture), the setting of daily life is greatly simplified. One can walk in to any ger (yurt) and know where most items are stored and what part of the ger and know what part of the ger is used for which functions. This level of simplicity liberates energy for art, laughter, family, and tribe. A final gift of the nomads is their intimate sense of connectedness. The circle is the symbol of interconnectedness, and the yurt makes this very real by creating a space for the family to live together in one large room, all the generations, interacting and creating a sense of tribe and family. Likewise, the veil between inside and outside is much thinner in a yurt; one knows when the wind blows or the temperature drops. the earth is truly underfoot, the night sky is visible through the smoke hole, and a sheep bleating in the middle of the night wakes up the herder. It is from this intimate sense of connection with all things around them that nomads living in balance in such a way that Mother Nature is never harmed. I have bolded my favorite part...I think that every one of us wants to "bring artistry to every element of daily life". Imagine yourself waking up tomorrow morning. You walk into the kitchen...and as you pour the crystal clear water into the kettle, you listen carefully to the sound of the water splashing on the bottom. After preparing your coffee or tea, you reach for your mug which hangs on a colorfulfully painted peg on the wall. Each person in your family has their own mug that they use for drinking. You chose your particular mug for the beauty of the design and for how perfectly it fits into your hand as you enjoy a steamy hot drink. You pour your creamer in and stand amazed at the lovely patterns it makes as it blends into the liquid. With each sip, you are reminded of how beautiful life is. Are you laughing at me yet? Ok, ok...it does seem a bit crazy. BUT...how would your life change if this was your reality? If you were able to see beauty in the mundane? Think about how different your kitchen would be if each person in your family lived with a nomadic mindset and only had what they needed? One plate, one bowl, one mug/cup, a set of silverware. *GASP! What about company?! * I didn't say you had to get rid of your excess place settings...just put them away. In a cupboard above the fridge...or in the basement. If you have older children, they can be responsible for their setting (cleaning, putting away, etc.). If their bowl is dirty, they don't take out another, they just quickly wash the bowl and use it again. If you want to really have fun...go to the thrift store and let the children pick out their very favorite plate/bowl/cup. It would probably cost about $2 per person...but it would give each person a sense of ownership. Some of my very favorite dishes came from thrift stores! If you are someone that has to have matching everything, this obviously wouldn't work for you :) I know from personal experience, that once I downsized my kitchen "stuff" by about 75%, life became very happy. Look at the things you use every day, and keep them. Everything else goes away (at least out of sight). I could have a fully functional kitchen with one large chef's knife and a few bowls. And remember... "this level of simplicity liberates energy for art, laughter, family, and tribe". Because who wants to do dishes all day? Be liberated! The second part of this quote speaks about living in close quarters...specifically one large "great room", and how it magically brings people together. Now that we have come "off the road" and out of the RV for a few months, we are noticing how hard it is to connect as a family. We really have to work at having time together...uninterrupted by TV, activities, and spacious homes. We REALLY like living in a small space because it's so easy to bond together and to truly live. It's been a great learning experience ... I don't think we will ever go back to a big house. Too much space to get away from your family! After awhile, you start to think you actually NEED that space. For those of you in Maine, you should venture to "Dickinson's Reach" on the northeast coast sometime to visit his homestead. I wish I would have known about it while we were up there this fall! Here is a nice little article about him...he's a man after my own heart: ''If living is to be right, it ought to be beautiful," declares Coperthwaite. Preach it, Bill! Can life be beautiful even with just a few possessions? Yes! This is just one of the reasons why I am in awe of the Mongolian culture (their gers/yurts in particular) and how they have taken such care in making their life beautiful. Every time I see one of their beautiful doors, my breath is taken away. I have also fallen in love with their furnishings. Pure beauty...in color and form. It's so interesting to me that we can draw insight and inspiration from a culture and lifestyle that most of mainstream America would deem as "primitive". Our country would be a different place if more families lived in such close community and focused on making life beautiful with less.